"...Puddingstone was a huge hit. The melding of traditional and new music along with the eclectic instruments and stage presence of the performers was wonderful! The audience was fully engaged from beginning to end. We can’t wait to have them return!" "...Puddingstone remains one of the most popular and delightful parts of Old Salem's Christmas scene. Loyal fans return year after year to enjoy this annual favorite and new audiences discover what will become an annual tradition. 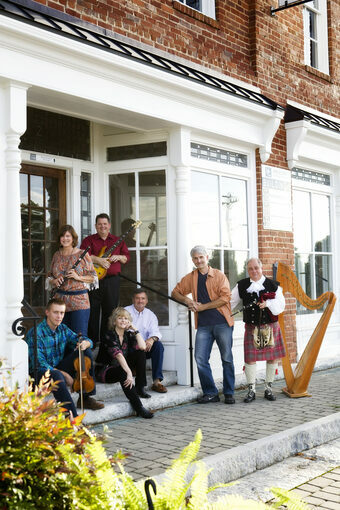 Ancient sounds of the harp, recorder, hurdy-gurdy, guitar, flute, drums and hammered dulcimer blend with those of electronic synthesizer to weave harmony, melody and rhythm into a magical experience for all ages." "...the musicians took advantage of every tool at their disposal to create wonderful sounds evoking timeless aspects of the human condition; faith, joy, celebration." Welcome to the Puddingstone website! We appreciate your interest in our band and hope you enjoy browsing the site. Click on the navigation buttons at top right to see our concert calendar, purchase CD's, contact us and more. Drop us a line to say hi. We love to hear from our fans and appreciate you so much!